When Ben Dattilo finds a question fascinating, he'll stop at nothing until he finds an answer -- even if that answer has stumped scholars for dozens of years. 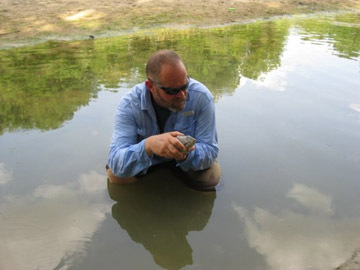 Dattilo, assistant professor of geology at Indiana University-Purdue University Fort Wayne, has been working for years on answering many questions, some of which he came up with as a child. The result has been a boon to Purdue and to his field. I remember exactly the moment this field grabbed my attention. I was about four years old and living in southern Indiana. The creeks there have a lot of fossils. I found one -- I actually found a bed of brachiopods, but I didn't know it at the time. I just took this little fossil home and drew it on a chalkboard. I have not able to escape the obsession since. In fact, like that fossil, I think almost every problem I work on started with a question I had when I was relatively young. Brachiopods are among the most common fossils you'll find, but few people study them. There are some that are still living, but there's an extinct kind, too, and that's the one I've studied. Superficially, it looks a bit like a clam. It has two shells, but one is convex and one is concave, so the shells fit inside each other. For years, all the way back to the 1850s, the biggest puzzle was how these critters survived in their native, muddy environment. A paper I wrote answered that. Essentially, I found that these filter-feeding brachiopods lived with their shells gaped open widely. This is different from the narrow, slit-like gape of most modern brachiopods. The wide gape allowed them lie on their concave side on the seafloor without sucking up mud. I also found that these brachiopods were able to move just a little bit, so they could clear this mud away with no problem. What else do you study? Everything I study kind of melts together. I'm very into marine sedimentation, or how reefs and the sea floor forms. I also study modern reefs and fossilized reefs. In fact, I specialize in a time period that's from 500 to 450 million years ago. I'm also particularly eager to involve undergraduates in my research. They help with all aspects: field work, sample preparation, interpretation and data processing. Partly as a result of these efforts, our undergraduate research presentations are a reliable feature at regional and national meetings of the Geological Society of America. Recent graduates also are very competitive at graduate schools. What public outreach have you done? Early in 2012, I participated in a program called Lunch with an IPFW Scientist. My group was a nice mix of several parents and children, plus some avid fossil collectors. I showed them a slideshow of living and fossilized reefs. I also showed them what the continents looked like millions of years ago, and I showed them where Indiana was. In the end, the attendees got a better understanding of what Indiana was like in the past, and that leads to a better understanding of the past in general. Ultimately, that leads to an understanding of why things are the way they are today. What outreach would you like to do in the future? I would like to expand upon the model that Jim Farlow, an IPFW professor of geosciences, and I developed in July 2012. At that time, we went to Texas with a few high school teachers to study some famous dinosaur tracks. I applied my knowledge to their research. Essentially, I determined to which layer the tracks belonged, and the teachers brought that research and Jim's back to their students in Indiana. In general, I'd really like to get the word out more about geology, especially in Indiana. Most students in this state have no idea about the employment opportunities in geology. The reality is that professional geologists do really well, but we have to get more students into this tough major. I want students to know that geology is a great career and a great discipline.